Home / airport / Oman Air / Why wont Oman Air accept my credit card? Why wont Oman Air accept my credit card? Now some of you may know that I fly to Salalah quite a bit, and I've written about my personal experience with Oman Air quite recently. Today, I am hoping someone can explain to me why I can't actually book my own flights with Oman Air. Admittedly, I am a bit stupid, but one thing that an expat knows how to do, and typically does do quite often, is book flights. The reason for my muppetry is that for the last 4 or so months, I've not been able to use my HSBC Oman credit (or debit) cards to purchase flights on the only website I'm aware of that can book flights for me with Oman Air (essentially the only way to fly between Muscat and Salalah). 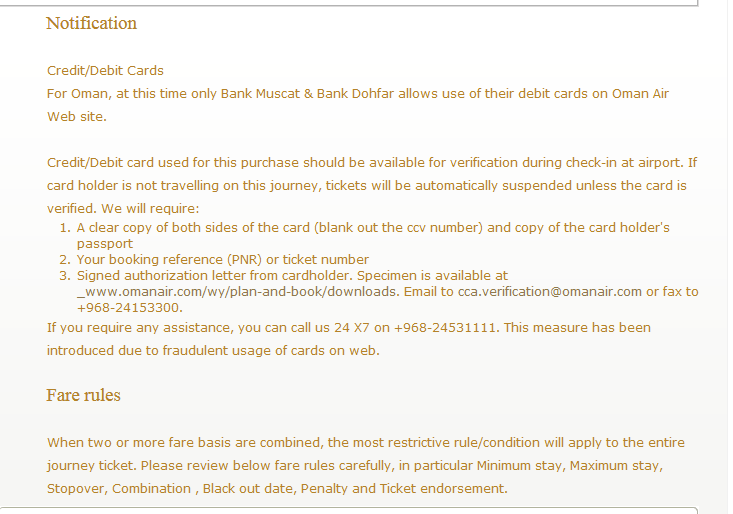 For Oman, at this time only Bank Muscat & Bank Dohfar allows use of their debit cards on Oman Air Web site. Now, for most people, a debit card is a card linked to their current account (or whatever) that debits that account. A credit card is a card that is in your name and charges your line of credit with a supplier, and you pay the supplier separately. The notification on the Oman Air website even states, credit, debit cards - clearly acknowledging there are two types of card. Perhaps the misspelling of Dhofar (Dohfar) is a give away? I don't know - but it's great to see one of the nations largest areas misspelled by its own national carrier - classy. All I do know is that unless I have a Bank Muscat or a Bank Dhofar credit (or debit perhaps) card, I can't book flights with Oman Air. Which is pretty annoying. It's actually really annoying. Now, the Oman Air press releases section of their site makes no mention of this rather major problem for residents of the country for which they are the national carrier of. In fact their press release section in typical fashion for this part of the world, neglects to mention any bad news at all. If this card payment issue is due to some spat between Oman Air and some local banks, surely this should have been resolved by now? I note that you can call up Oman Air and book flights over the phone with them, and use a HSBC card. But here's the rub: You have to pay a RO 15 booking fee when doing this over the phone. You can drive to the airport, park, go in to the airport and purchase a ticket with an HSBC card directly at the Oman Air ticket office there without a problem. So, why exactly can't we use our credit cards (unless we're banking with Bank Muscat or Bank Dhofar) on the Oman Air website? If I was a cynic, I'd say that someone at Oman Air is pals with the large travel agents here and they've got a little side-line going on. I doubt that's true, but what is, is the apparent zero interest in Oman Air to fix this really annoying problem with ticketing. Does anyone know why this has been happening, and when we can expect this issue to be fixed? Should the PACP be investigating this? You can use visa or mastercard CREDIT cards, but only use Bank Muscat and Bank Dhofar DEBIT cards. I dont think its an issue with Oman Air, rather the banks themselves as debit cards are riskier. Anonymous, thanks for commenting. I've tried HSBC CREDIT cards (Mastercard and Visa, as I have both) and it does not work. From the message posted to the Oman Air website, you'd think that you could use a Credit card, just not a debit card, but the reality is, you can't even use a credit card unless its from Bank Muscat or Bank Dhofar. When do you book your flight? I am thinking that there might be a glitch in the system where it doesnt show you if there are still seats aviaiable. What i also know if that your not allowed to book flight 24hrs or so within the time of your required flight. FYI, my husband had an issue with his HSBC card and Oman Air online booking site. Can confirm that even Dhofar Bank Debit cards dont work. I reckon that this has something to do with the Gateway used by Oman Air. At this time only BankMuscat and BankDhofar are connected thru the local MIGS gateway. Therefore local credit cards work as long as they are from BM or BD. In my limited experience I believe the culprit here is the gateway and not the card issuer. But I could be wrong. You are simply using the wrong card. Dishdashas far smarter than you have decided that this is the best way to run an airline, yanni. Paid for dozens of flights on Oman Air with my NBO CREDIT card - it says on my NBO DEBIT card in teeny tiny writing that you cant use it on line - without problems so far. Oman air did try and dump my son in London once because their stupid "verification" system which requires you to send a complete ID thief's tool kit - Passport, Credit Card and Signature had not worked - this despite me calling their "Customer Service" number the week before to make sure it had all happened properly. Amazingly for some reason my letter to Wayneo basically saying "what kind of an ##### outfit do you think you are running here" never got a reply. I suspect that the double incompetence hit of HSBC (six months to open an account) and Oman Air is completely fatal. I've never had any problem with OmanAir and using an HSBC *credit* card. Was unable to book flights for July back in June using Omani HSBC card and UK credit card. Kept trying, thinking it must be a temporary thing, but in the end had to book with travel agent at QCC, who were very helpful. The delay in booking meant our train from Paris was fully booked, so had to find alternative to that. At the time, there was no 'useful' message about the problem either. We would fly with another carrier but Oman Air are the only ones who fly non-stop to Paris. Does anyone know different? Sean MuscatI could not use my HSBC card on a booking from Dubai a couble of months ago; te airline said that I had a problem with my bank....not so!! I have used my HSBC Mastercard to book a flight to London with Itihad in a few days because again Omancare would not accept my card again. Etihad did accept my payment and therefore Omancare looses the business. Does anyone care at Omancare? I rather doubt it. It is not just Oman Air I cannot book cinema tickets for vox online using HSBC debit or credit cards,message says gateway will not accept card. To be honest, it's often better to use an online travel agent to book flights with some of the Middle Eastern airlines who have the ridiculous security processes . Incidentally Bahwan Travel allow online booking.